Naturally, since Belleair Coins is in the business of buying and selling coins, we hope you will choose us as your coin dealer. Americans were not allowed to own gold in any form from April 1933 until Jan. 1975. The average buyer is a bit nervous and inexperienced when it comes to buying bullion. In most large urban areas there are at least several dealers. The coin business is always very competitive. Gold and silver are basically commodity items and as with all commodities, the dealers have to work close and be very competitive or they won’t get much business. Most people choose a local dealer that they feel they can trust, and with whom they feel comfortable. There are many good bullion dealers throughout the US who do a lot of business via the Internet, phone and mail, but the only problem is that one can’t just walk around the corner to make a fast transaction, or straighten out any problems face to face. People should shop around, ask around and deal where they feel it is to their best interests. The local dealer can be a great asset. As of July 1, 1999 there is no longer any Florida sales tax on foreign coins or bullion purchased in amounts over $500. All legal tender US coins are also free from state sales tax. 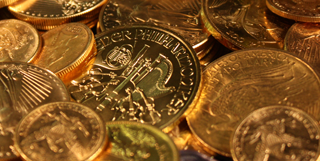 There is no tax on coins or bullion of any kind that is shipped out of state. You may now invest in gold and silver just as you would invest in the stock market. We buy and sell all coins and precious metals. We will not store anyone’s coins or metals. The cardinal rule for people investing in this type material is to TAKE DELIVERY!